I used to stop in at Uncle Bob's diner when I was a boy of 10 living in Flint. That place was absolute heaven and I loved the smell inside and the food was the best in the whole wide world - at least I thought so! I will forever miss Uncle Bob's Diner and even to this day I sometimes look for it whenever I'm downtown. I'm 62 now and I say bring it back!! Bring back the 1950s !! Jerry Berta u sure HAD a good thing going when u ran it.i understand the part of wanting out.i dont know any way to tell if someone means buisness with a new buisness they want to buy.but if there had been it sure would ave been nice.i hope someone does better this time around. when u ran it was something. last jan in 2011 the last time i was there i regreted being there it was a mess.not very many people in it.it seemed to many workers standing around. As a young man I worked a block from Uncle Bob's at the Flint Journal. It was great place for lunch or to take a date after going to the Capital or Palace Theaters. Jerry Berta who puchased it and moved it to Rockford MI used too be a tax client of mine so I DO know Uncle bob's. My grandma was a waitress at Uncle Bob's when I was quite small. I just adored going to work with her; seeing the regulars, eating lemon slices at the counter, spinning on the stools. It was just a wonderful, friendly, comfortable place. I just caught a 2008 episode of "Food Paradise" and was thrilled to see that Uncle Bob's had been moved to Dinerland, and not been lost to the wasteland that downtown Flint had become. Now I see that Dinerland, too, is closed. Wonder if Greenfield Village is in the market for a real Michigan treasure, or if Uncle Bob's is destined to become just another nostalgic memory. The most recent owner and operator, Jonelle Woods, filed Chapter 7 personal bankruptcy in 2011. Apparently the restaurant company also went bankrupt. At the time, it appeared from Kent County records that the property, and likely the buildings, belonged to Woodcock Real Properties LLC, a real estate holding company controlled by Jon Woods of Bloomfield Hills...Jonelle's father. My guess would be that if the buildings are not being actively maintained, probably they still belong to Mr. Woods' real estate company. If they'd been sold, likely the new owner would be doing something with them. I just mention that in case anybody wants to buy the Uncle Bob's building and move it back to Flint. Diner. His name was Stewart Hinkins, and lived in Davison, Mi. I have been looking for that cheesecake recipe for years! Any chance you would have it or know where I could get it? It was in the Flint Journal many many years ago. I wish I had it too. 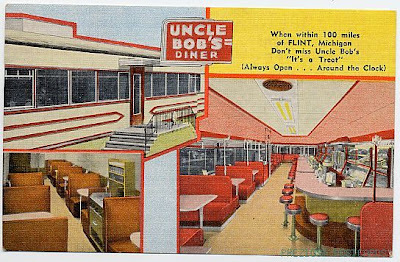 before visiting family in Flint from Grand Rapids my parents made a beeline for Uncle Bob's , as a little kid i thought was a actually relative. when we got to the relative they always had food prepared but we were all full. We lived in Burton and it was such a treat when my mom took myself and 2 sisters there. We always had the rare roast beef sandwich with butter on it. And of course potatoe chips and a dill pickle spear, so good. When I was a teenager a great date was a movie at the Capitol and then a later dinner at Uncle Bob's. Now when I'm downtown I almost always look over to the spot where it used to be. Sad. Uncle Bob was Robert Hurst, he and my great aunt Roberta Bowman owned and ran the original diner from the mid/late 50's til about 1975ish. Bob was the baker of the two and it was cheese cakes everyone came for. while my aunt, (and the rest of the Bowmans) had a knack of making thee best onion rings anywhere. while i was only a kid back then i remember fondly going there after church, sitting at the counter and getting a spatula slap on the head everytime i went. I remember going there when I was young. It was a big event to go there with my Mom. We took the bus to downtown Flint and went to my dance class at Honolulu Conservatory of Michigan and then would have lunch sometimes at the Home Dairy and sometimes Uncle Bob's. It was a very special afternoon my Mom and I had. Absolutely loved it. In those days you dressed up to go "downtown". We took the trolly cars before the bus came into use.